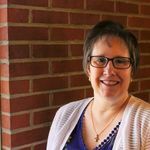 I have been reading Emily P. Freeman's blog for a few years. I have also followed along with her "what I learned" series. She had done it monthly and now puts a link up for quarterly. You can read her post and others' here. 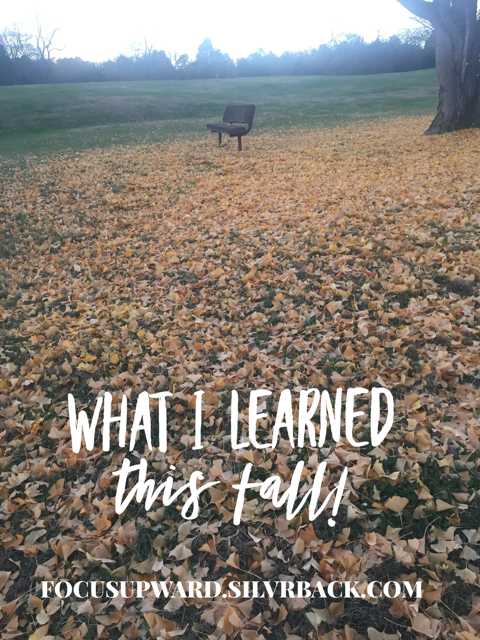 So, I decided to give it a try for fun, and decided that since it's turning to winter tomorrow, I better get "What I Learned This Fall" posted ASAP! So here we go in no particular order! 1. Don't open the moonroof in your car, after a big rain, even if the sun is out. I did that the other day and it was all fine and lovely until I stopped at the first stop sign...well you can probably imagine the rest! 2. I REALLY do like ALL things PUMPKIN...lattes, coffees, doughnuts, munchkins, English muffins, M&Ms, Cheerios, almonds and popcorn. Yes, I did purchase and personally tried all of those things! 3. It's fun to receive and pay if forward...one Friday in Sept. I was happy to get a venti PSL (pumpkin spice latte) and even happier to hear from the barista that the person in front of me in the drive-through had paid for my drink and sandwich. I then, in turn, blessed the person behind me. Just thinking about it and waiting for my coffee, brought tears to my eyes. There are still good, kind and generous humans in this part of my world! 3. Good Reads (online and an app) ...ok, I probably found this 6 months ago, but oh my....it makes my "list self" VERY happy. I can mark those books I hear about (in blogs and from friends) as "want to read". I can keep up with my "currently reading" either by page or percentage and then I can file them away in "already read" AND I've made a new "shelf" for 2016 and another for 2017. My goal is to read 24 books this year and I just have 1 more to read! 4. Weekends are too short. 5. It should NOT be 95 degrees in TN in Sept. nor 32 degrees in Oct.
6. I need to read emails more slowly and note the date. 2 times I had prepared for training type meetings (where I was training/talking to others) and BOTH times I was 1 week early. Better early than late...just didn't need the rushed feelings. 7. I CAN blog daily (well almost, ran just a couple days behind) for 31 days! I learned that writing takes discipline and that each and every post doesn't have to be perfect in order to be good and to bless others. Check out my Proverbial Journey. 9. Riffle Raffle is a cool new (to me) app. If you do online parties and need to pick a winner this works great! 10. Word Swag...again, another app for your iPhone and makes GREAT looking graphics for blogs or Facebook or whatever you may need. That's what I used for the picture at the top! 11. 1 more...almost forgot! It was fun going to a conference by myself and making new friends! Hope you enjoyed Fall and are ready for Winter!